We’ll Waive your Deductible…But Beware! Don’t put you or your families safety in jeopardy! 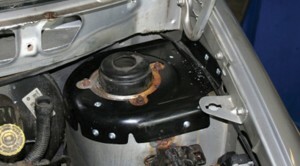 Repair Chrysler, Dodge or Plymouth mini van strut towers! The Body Shop in Clinton Township, MI can fix your 1996-2000 Chrysler, Dodge and Plymouth mini van rusted strut tower with an aftermarket repair kit designed to extend the life of your vehicles strut tower. The Body Shop Inc. repairs the Caravan, Town & Country and Voyager strut towers and restores the safety of your vehicle at an affordable price. 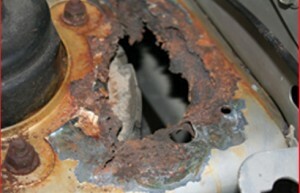 Repairs can usually be completed same day reducing the inconvenience of tying your vehicle up for days. The Body Shop in Clinton Township, MI. is Macomb, Oakland and Wayne Counties leading collision repair facility for a reason: We have the latest innovative repair techniques that save our customers money! 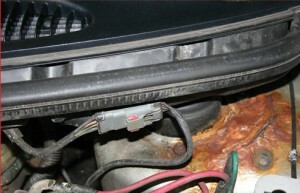 If this problem is not fixed the strut can come up through and the car will then fall down and be totally disabled. This is what the repair looks like! Gary Oakie is the owner of The Body Shop located in Clinton Township, Michigan (Macomb County). Gary has over 30 years experience in auto body repair and refinishing. He is also a specialist in Corvette repair. For more information on our services click on the services tag at the top of the page.